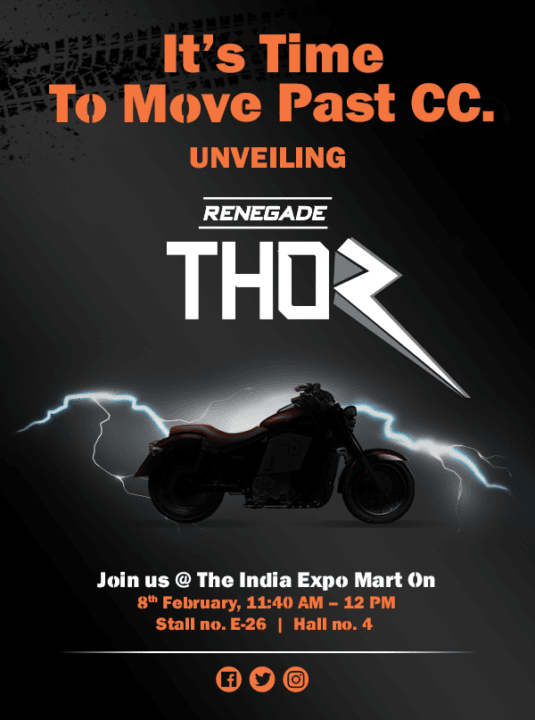 United Motorcycles, one of the newest two-wheeler manufacturers in the ever-growing Indian Two Wheelers market, will unveil a new motorcycle at the fast-approachingAuto Expo 2018. Christened as the UM Renegade Thor, the upcoming UM motorcycle was recently teased in the image you see below. After its launch, the UM Renegade Thor will become the only electric cruiser motorcycle in the country. Prices will be revealed at the motor show. However, we are expecting a starting price of roughly Rs 6 lakh. The UM Renegade Thor Electric Bike is built on an all-new platform that will also go on to underpin future electric two-wheelers from the company. Powering the motorcycle is a 30 kw electric motor that outputs roughly 50 bhp of maximum power. This motor is sourced from Italian company Tacita Electric Motorcycles. It is claimed that the UM Renegade Electric bike has performance comparable to that of a typical 600cc motorcycle. This electric motor comes mated to a five-speed transmission and is a water-cooled unit. The motorcycle is claimed to have a range of 150 KMs on a single charge. There is also a provision of fast charging, wherein the batteries can be charged to 80 percent in just 40 minutes. Not much more is currently known about the new UM Renegade Thor. However, you can safely stay tuned to Carblogindia for the latest news updates on cars and motorcycles in India.